"Marshland" redirects here. For the 2014 film, see Marshland (film). For other uses, see Marsh (disambiguation). Marshes provide a habitat for many species of plants, animals, and insects that have adapted to living in flooded conditions. 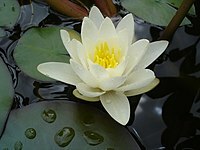 The plants must be able to survive in wet mud with low oxygen levels. Many of these plants therefore have aerenchyma, channels within the stem that allow air to move from the leaves into the rooting zone. Marsh plants also tend to have rhizomes for underground storage and reproduction. 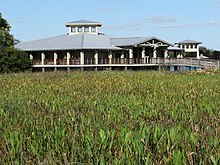 Familiar examples include cattails, sedges, papyrus and sawgrass. Aquatic animals, from fish to salamanders, are generally able to live with a low amount of oxygen in the water. Some can obtain oxygen from the air instead, while others can live indefinitely in conditions of low oxygen. Marshes provide habitats for many kinds of invertebrates, fish, amphibians, waterfowl and aquatic mammals. 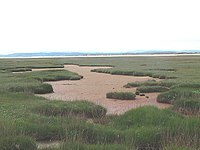 Marshes have extremely high levels of biological production, some of the highest in the world, and therefore are important in supporting fisheries. Marshes also improve water quality by acting as a sink to filter pollutants and sediment from the water that flows through them. 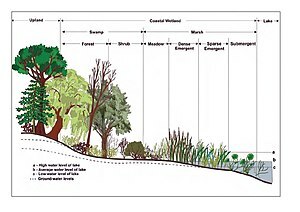 Marshes (and other wetlands) are able to absorb water during periods of heavy rainfall and slowly release it into waterways and therefore reduce the magnitude of flooding. The pH in marshes tends to be neutral to alkaline, as opposed to bogs, where peat accumulates under more acid conditions. Prairie potholes are found in the northern parts of North America as the Prairie Pothole Region. These landscapes were once covered by glaciers, and as a result shallow depressions were formed in great numbers. These depressions fill with water in the spring. They provide important breeding habitats for many species of waterfowl. Some pools only occur seasonally while others retain enough water to be present all year. Large tracts of marshland have been embanked and artificially drained. They are usually known by the Dutch name polders. In Northern Germany and Denmark they are called by the name Marschland or marsk. In East-Anglia the embanked marshes are known as Fens. ^ World Encyclopedia. "Marshes". Archived from the original on 23 May 2013. Retrieved 4 February 2012. ^ a b c d e f Rafferty, J.P. (2011). Lakes and Wetlands. New York, N.Y.: Britannica Educational service publishing's. ^ B.R. Silliman, E.D. Grosholz, and M.D. Bertness (eds.) 2009. Human Impacts on Salt Marshes. A Global Perspective. University of California Press, Berkeley, California. ^ Calhoun, A.J.K. and P.G. deMaynadier. 2008. Science and the Conservation of Vernal Pools in Northeastern North America. CRC Press, Boca Raton, Florida. ^ United States Environmental Protection Agency. "Playa Lakes". Archived from the original on 4 February 2012. Retrieved 5 February 2012. Wikimedia Commons has media related to Marsh.